A Primer on Animal Rights is a learning tool for helping all of us find our connections to our fellow creatures and to champion their journey. To live fully and to live well is to be an empathetic soul. By sharing their own experience as animal rights activists, the contributors to this book both inspire and encourage the rest of us in our quest to extend the golden rule to our fellow travelers, the many animals who share this moment on earth with us. The book contains work by some of the world’s leading authorities, including Gene Bauston (Farm Sanctuary), Marc Bekoff (Minding Animals), Karen Davis (United Poultry Concerns), Pat Derby (Performing Animal Welfare Society), Mike Markarian (HSUS), Jim Mason (An Unnatural Order), Wayne Pacelle (HSUS), Norm Phelps (The Longest Struggle), Jill Robinson, Animals Asia Foundation, and Richard Schwartz (Judaism and Vegetarianism). 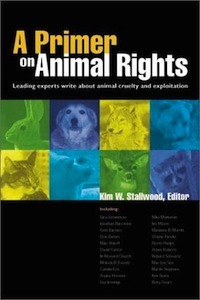 A Primer on Animal Rights is published by Lantern Books (2002). Animal Rights: Moral Crusade or Social Movement? Are We Smart Enough to Know When to Take the Political Turn for Animals?